"A tornado in the form of Karen Irwin touched down." In the face of a society that continues to tell us that we are not good enough, not smart enough, not pretty enough, too big or too loud, Karen Irwin reminds us to use our voices, unapologetically. Janis, Me and Bobby McGee is a triumphant journey of discovery and celebration. 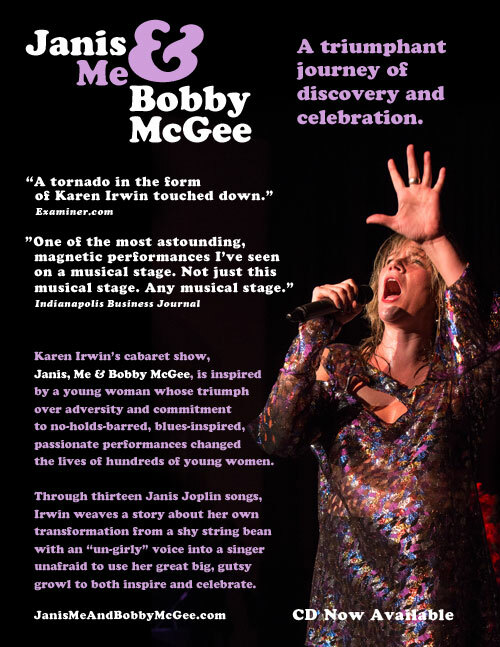 Karen drives this powerful cabaret show backed by a professional band. Sold out shows. An enthusiastic and beyond loyal fan base. Get out of the way, people. This is going to be one hell of an experience. "One of the most astounding, magnetic performances I’ve seen on a musical stage. Not just this musical stage. Any musical stage."